Cold and flu season seems to creep up every year. One minute you’re outside soaking up the sunshine and the next, you’re curled up in bed with body aches, a sore throat, and the sniffles. There are all kinds of medications and over-the-counter treatments for colds and the flu, but most of them only work by masking the symptoms. A more natural approach to battling cold-weather viruses is to focus on nutrients and treatments that boost our immune system function and enhance our natural defenses, allowing us to heal from within. 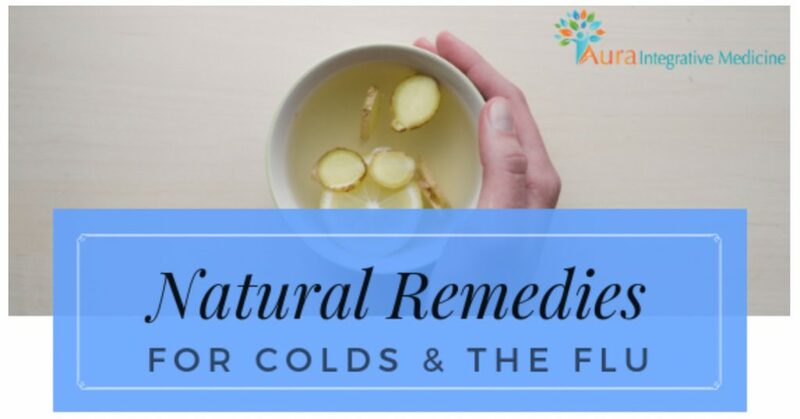 The following are some of the best natural treatments for colds and viruses including the flu. Many of these remedies and nutrients are also effective in the prevention of viruses, and can be taken proactively throughout cold and flu season in order to ward off illness before it arrives. Ginger: Ginger is one of the most powerful natural remedies out there thanks to its ability to boost the immune system, provide antioxidants, reduce inflammation, and relieve symptoms including sinus congestion, nausea, and fevers. Great ways to get ginger into you when you’re sick include making fresh juice or tea with ginger root. Chamomile: Chamomile tea is soothing and delicious, and it helps to reduce inflammation and promote restful sleep. Garlic: Chewing on raw garlic may not be very appealing, but it is one of the most effective natural remedies out there. Garlic is full of vitamins, minerals, and other nutrients that are essential for healing and prevention during flu season. It is an antioxidant and offers antimicrobial, antibiotic, and antiviral benefits, as well as helping to relieve symptoms including congestion. Cinnamon: Add cinnamon to hot water with lemon and honey or another hot, healing drink, for an extra boost of anti-inflammatory, antimicrobial, immune boosting power. Eucalyptus: An easy at-home remedy for viruses is to add fresh eucalyptus leaves or eucalyptus oil to a pot of just-boiled water and breathe in the steam. Make sure to cover the pot and your head with a face-cloth or towel. Eucalyptus helps to improve respiratory symptoms and also has antiviral, antibacterial, and anti-inflammatory benefits. Honey: A small amount of honey added to hot water or tea can help to soothe the throat and promote restful sleep. Echinacea: Echinacea, which can be taken in water or tea, is an herb that can help to tackle inflammation and reduce sore throat and other cold & flu symptoms. Coldcalm: Coldcalm is a great homeopathic blend that helps to relieve cold symptoms including sneezing, congestion, sinus pain, and sore throats. Oscillococcinum: Another effective homeopathic medicine, Oscillococcinum is great for relieving flu and flu-like symptoms including headaches, fever, chills, and aches and pains. Vitamin D: Vitamin D supplementation can be extremely helpful both in the prevention and the treatment of colds and viruses, and adequate regular intake of vitamin D can also help to ward off chronic illness. Vitamin C: Vitamin C is crucial for immune system support and recovery from colds and the flu. Vitamin C can be taken in high doses (to bowel tolerance) throughout the day. Zinc: Essential mineral zinc can help to decrease the duration of colds and viruses and boost the immune system. When you’re battling a cold or the flu, it’s critical to get lots of rest. You will need more sleep than you usually do in order to recover. It’s also important to drink plenty of fluids (more than usual), especially water and herbal teas containing healing ingredients like ginger and lemon. If you have no appetite, don’t worry too much. It’s actually natural for your body to ask for less food when you’re sick, so that it can focus more of its energy on immune function and healing, and less on digestion. You still need to eat something, but it’s a good idea to stick to simple, nutritious, cooked vegetables, chicken soup, and bone broths while you recover. Another great way to fight viruses is to diffuse essential oils. Peppermint, eucalyptus, and lavender are a few options that offer immune-boosting benefits and can help to relieve symptoms including nausea and congestion. Please note that all recommendations here are guidelines only. It is always advisable to speak with your practitioner about supplementation and the use of treatments, including herbal remedies. For prolonged illness or illness that does not improve, seek medical attention. To book an appointment with functional medicine practitioner Dr. Nair, MD, click here.